This page is about the aircraft B-34. For the navalized gift version, see PV-2D. The B-34 is a Rank II USA bombers with a battle rating of 2.7 (AB/RB/SB). It was introduced in Update 1.65 "Way of the Samurai". The B-34 is a typical American bomber in the sense that it's decent payload is outdone by its defensive armament. While it's maximum payload and the ability to carry a torpedo is nice, it's not necessarily as good as it's ability to take and give out damage to other aircraft. Start with base/pillbox bombing, and should an enemy fighter come to engage, give him hell with your turrets. do slight maneuvers constantly to throw off his shots while trying to put as many shells into his engine/pilot as possible. with any luck he will fall out of the sky in no time. 633 235 340 ~?? ~? Reasonably effective defensive armament with good coverage on the rear section of the plane. Can provide initial cover for other bombers until fighters reach their altitude. 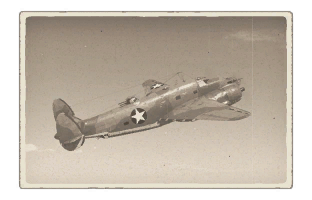 For the most part, the offensive armament will only be useful in attacking enemy bombers, ground targets, or engaging fighters head-on, as the plane is too unmaneuverable for any real dog fighting of any kind. Steel construction makes this plane particularly heavy, and a small payload limits this plane's ability to be used as a tactical or strategic bomber. The Elevator can be shot off by an enemy plane easily. This can cause it to become uncontrollable in certain situations. However, it can still be controlled by operating flaps or adjusting engine power. In the beginning of the war, the British was looking for a medium-ranged anti-submarine warfare and patrol aircraft to support the existing Avro Anson. The Lockheed company sent a drawing of thier model 144 civillian airliner. The British Purchasing Commission saw the design and asked Lockheed to make modifications to the model 14, also known as the Lockheed Super Electra. Modifications include two fixed forward-firing Browning 7.7mm machine guns in the nose. There was also the installation of Boulton Paul dorsal gun turrets with two Browning machine guns. Some models had beam guns installed, other had different engines or propellers. They called it the Hudson, eventually it needed a replacement. So Lockheed made it bigger and heavier and introduced it as the B-34 Lexington. It went under the US Army as the B-34, and the Navy as PV-2 Harpoon. (V because Vega aircraft division of Lockheed made the Harpoon.) 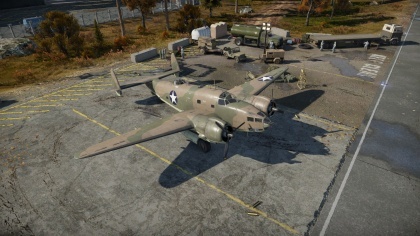 In British service it was simply called the Lockheed Ventura.